Left Universalism, Africacentric Essays presents a defense of universalism as the foundation of moral and political arguments and commitments. Consisting of five intertwined essays, the book claims that centering such arguments and commitments on a particular place, in this instance the African world, is entirely compatible with that foundational universalism. Ato Sekyi-Otu thus proposes a less conventional mode of Africacentrism, one that rejects the usual hostility to universalism as an imperialist Eurocentric hoax. 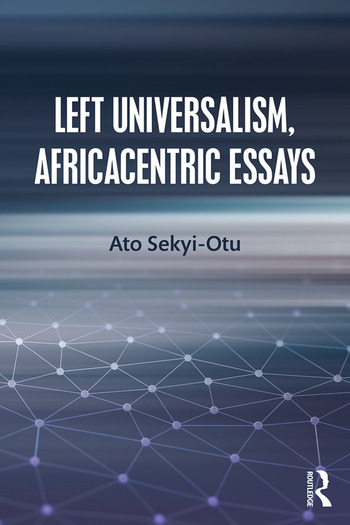 Sekyi-Otu argues that universalism is an inescapable presupposition of ethical judgment in general and critique in particular, and that it is especially indispensable for radical criticism of conditions of existence in postcolonial society and for vindicating visions of social regeneration. The constituent chapters of the book are exhibits of that argument and question some fashionable conceptual oppositions and value apartheids. This book will be of great interest to students and scholars in the fields of social and political philosophy, contemporary political theory, postcolonial studies, African philosophy and social thought. 1. Is She Not Also a Human Being? Ato Sekyi-Otu is Professor Emeritus in the Department of Social Science and the Graduate Programme in Social and Political Thought at York University, Toronto, Canada. He is the author of Fanon’s Dialectic of Experience. … This is a brilliant book by a genuine scholar and intellectual. Erudite, thoughtful and productively critical, it genuinely pushes our thinking forward to a reassessment of a number of core concerns of primary interest to those who wish to imagine a different world beyond current capitalist society…. This book deserves the Fanon award for many reasons…. The text is a sober intervention in political theory from the global south—specifically, west African political thought as a point of departure into debates on ambivalences plaguing contemporary left political theory. It addresses the unfortunate tendency to treat key theoretical concepts such as universality and individuality as imports into the African context instead of part of the already critical discourses of African societies. … It is a much-needed text in contemporary political philosophy written by a giant in African political thought (as well as a giant in Fanon Studies)….